In memory of the 77 in Norway and the 96! - LFChistory - Stats galore for Liverpool FC! In memory of the 77 in Norway and the 96! Choosing to visit Norway in 2011 was an easy decision as it is a country I know very well from over twenty previous visits. Once I discovered that Liverpool would again be playing in Oslo as part of their pre-season schedule, no other city or country had a chance of tempting me away from my choice of holiday location this summer. It was entirely appropriate that my hosts were members of a family I first met way back in 1974 when I was one of a very small band of supporters who travelled from England to Scandinavia to watch Liverpool play Strømsgodset in the European Cup Winners’ cup. Since that inaugural trip I have returned to Norway many times to watch Liverpool play and just as in 1974 (although the stadium has changed significantly since then) Liverpool would be playing at the country’s national stadium, Ullevål, in the capital. The match on August the 1st would be the 9th time that I would watch a Liverpool team play at this stadium and the 14th occasion I would see Liverpool play in Norway. Despite the familiar surroundings, I found a quite different Norway from previous visits because of what happened on the twenty-second of July just 6 days before my arrival. With an hour to spare before I went to the Scandinavian Supporters’ Club’s traditional pre-match meeting, I walked across to the cathedral to witness the floral tributes that had been left there in memory of the 77 victims of the bombing and shootings. It was a quite amazing sight, partly because it reminded me so much of what I had seen at Anfield five days after Hillsborough. The similarity ends with the way Norway’s victims died but in terms of the number of victims and their young age similarities can be drawn. Over fifty teenagers lost their lives at Utøya last month. I walked back past more floral tributes in Youngstorget to the venue where the Supporters’ Club’s meeting was being held with tears streaming down my face, desperate to compose myself before I went inside. My intention had been to comfort some of my many friends in the Supporters’ Club at their country’s sad loss; instead some of them had to comfort me. Liverpool FC’s visit and the decision to continue with the massive Norway Cup youth football tournament gave the right message to a nation struggling to cope with what had happened, that message being that Life has to somehow go on despite such a terrible loss, something we as Liverpool supporters know only too well. For a couple of hours inside the stadium, some sort of normality was restored to a grieving country. As I walked around the city-centre, people still smiled when they talked to you but you could see the sadness in their eyes. Oslo and the small, tranquil island of Utøya were possibly the last places in the world you would expect something so tragic to happen. It is hard looking in on someone else’s grief but I felt so much empathy with this proud country and its kind, hospitable people because of my own memories of 1989 and the heartbreak sudden loss brings. Norway reacted well to a date that will go down in Infamy as one of the most heinous acts ever committed by an individual. Representatives of Liverpool Football Club laid their own tribute to the victims outside the cathedral. On re-visiting the cathedral a couple of days before I returned to England, I noticed a number of Liverpool scarves that had been tied to the railings by supporters who had been in town for our match. The staggering success of the Scandinavian Supporters’ Club means that the profile of Liverpool Football Club is as high as it ever has been in Norway. We can share Norway’s collective grief because we know what it feels like ourselves. The minute’s silence before our match in Oslo was observed impeccably. It was in complete contrast to the moronic decision to applaud for a minute at Hull nine days earlier. If a man or woman has achieved great things in their life, sure applaud that. But to clap when dozens of people have been massacred is just wrong. It wouldn’t have happened at Anfield and thankfully it didn’t happen in Oslo either. We will never forget the 96 lives we lost at Hillsborough. Norway will never forget the 77 lives taken in July this year. 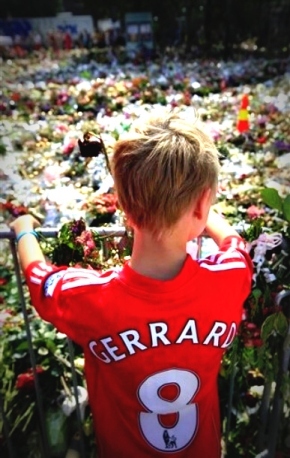 Later in the same week in which Liverpool played in the Norwegian capital, there were 18 funerals for terror-victims on the Thursday and another 30 on the Friday. Anyone who attends a competitive match at Anfield knows that there are always dozens maybe hundreds of Norwegians present too. Now we share a tragic bond with our cousins across the North Sea. A madman with a powerful gun might not bear comparison with a police commander and a newspaper editor with distorted ideas about what the word Truth means. But the result was the same. Dozens of (mostly young) lives tragically lost, the supporters of the future in our case, the leaders and politicians of the future in theirs. To all the victims of Hillsborough, many of whom will bear mental scars for the rest of their lives, To all those affected by what happened in Norway on the 22nd of July 2011, you never did walk alone and those left behind will ensure that you are never forgotten. Copyright - Chris Wood ([email protected]) - First image courtesy of Chris - LFChistory.net does not own the image of the boy in the Gerrard shirt.